There may not be much breaking news in the world of Jack Trevor Story, but I'll bring you what I know. I've seen dodgy copies of Postman's Knock and Mix Me A Person before, clearly recorded from TV showings. It's good to see better releases arriving now. It looks as if all these are in 16:9 format and of reasonably watchable technical quality. 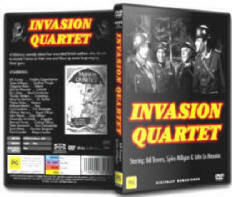 Invasion Quartet is an Australian release from a company called Onyx in PAL format and it plays in Regions 1,2,3 & 4. Looks like a legitimate release but I can't find any info online about this company. Screenplay by JTS and John Briley, based a on a story by Norman Collins. A WW2 comedy drama with Spike Milligan and John Le Mesurier. In Australia Postman's Knock is out on a double bill from Onyx, paired with a Harry Secombe comedy of similar vintage called Davy. It is thus probably also PAL / Region 1,2,3 & 4. (The packaging doesn't say). Screenplay by JTS and John Briley, based a on a story by JTS. 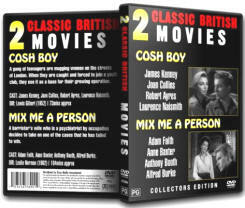 Mix Me A Person (1962 with Adam Faith) has also been released on a double bill (with another teen-thug drama, Cosh Boy) by Onyx. It is thus probably also PAL / Region 1,2,3 & 4. (I haven't seen a copy yet). 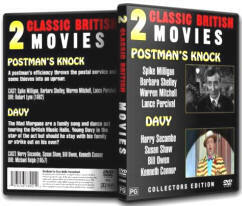 Amazon UK is listing Postman's Knock in both versions and the Mix Me double bill. Invasion Quartet shows as unavailable. Amazon prices for the Australian imports are very high. I have found copies more cheaply on eBay. Amazon US is only listing the Televista release of Postman. The committee awarding the Jack Trevor Story Memorial Cup for humorous writing this year presented the cup to an American for the first time. Meeting at its traditional venue, L’Horizon, rue Saint Placide, Paris, the Committee consisting of Iain Sinclair (UK), Michael Moorcock (US/UK), Lili Sztajn (France), Jeff VanderMeer (USA), Fabrice Colin (France), Lisa Tuttle (Scotland) and Sebastian Doubinski (Denmark) unanimously agreed to give the Jack Trevor Story Memorial Cup, together with a $1000 prize to Howard Waldrop, author of Them Bones, The Texas/Israeli War and several collections of short stories including Dream Factories and Radio Pictures and Heart of Whiteness. The Cup was presented to the winner by Michael Moorcock during a special ceremony at the Doubletree Inn Hotel, Austin, Texas on Friday 14th August 2009. 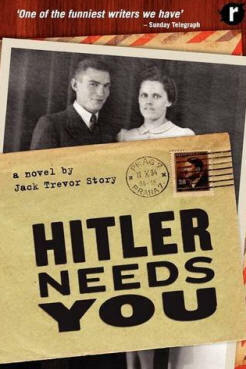 RALPH JONES writes from REINKARNATION PRESS with the excellent news that HITLER NEEDS YOU is published on Sept 3rd 2009. He adds: "We will do the rest of the 'Horace' Trilogy in the next few months."